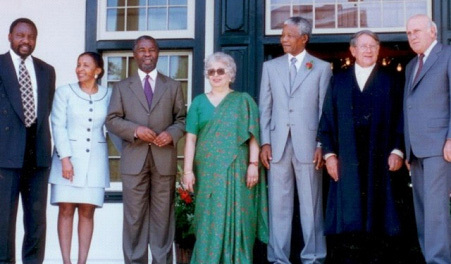 From 27 April 1994 to 3 February 1997, South Africa was governed by a Government of National Unity (GNU) under the leadership of African National Congress (ANC). Clause 88 of the interim Constitution of South Africa provided for the establishment of the Government of National Unity. After the first democratic election in 1994, 19,726,579 votes were counted and 193,081 were rejected as invalid. The African National Congress (ANC) in alliance with the labour confederation COSATU and the South African Communist Party fell slightly short of a two-thirds majority. The Government of National Unity was established and headed by Nelson Mandela as a president and FW De Klerk as his deputy president. Mandela’s cabinet included ministers from other political parties as well as members of the National Party and Inkatha Freedom Party. The notion of Government of National Unity, encompassing all political parties that enjoyed a threshold of 10 percent of support in the electorate, came from the ANC as one amongst many instruments to ensure inclusivity during the transition period from apartheid to democracy, 1990 - 1994. The mission of the GNUwas to oversee a new South African Constitution, as well asto radically improve the quality of life of all people of South Africa. Recognising that gross human rights violations and atrocities had been committed during the apartheid period, the GNU established the Truth and Reconciliation Commission (TRC). The TRC sought to uncover the truth about past violations of human rights, facilitate reconciliation and grant amnesty, provided that perpetrators fully disclosed politically-motivated crimes and provided evidence that led to investigations and prosecutions. The GNU contributed immeasurably in improving the spirit of reconciliation in South Africa. Government of National Unity 1994. The National Party (NP) held its Federal Executive Committee where it decided to withdraw from the Government of National Unity with effect from 30 June 1996. 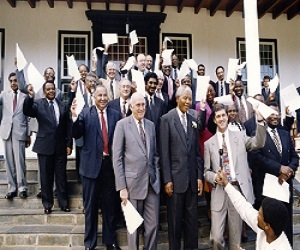 On 3 June 1996, the NP under the leadership of F W de Klerk, who was also the Deputy President at that time, announced its withdrawal from the GNU. The main reasons cited by F W de Klerk was the exclusion of joint-decision making from the final constitution, the NP’s lack of influence on government policy, his retirement from politics in August 1996, and that the NP had adopted its new role as a fully fledged opposition party. The NP inaugurated a new leadership under Marthinus van Schalkwyk. Later, the NP ended its cooperation with the Truth and Reconciliation Commission (TRC) on the ground of political bias. From his speech during the debate of his budget vote on 3 June 1996 in Parliament, FW de Klerk, explained his decision to withdraw from GNU: “continued participation in the GNU was equivalent to a death sentence for even the broadest and mildest concept of Government based on consensus. Continued participation would be equivalent to detention on a kind of political death row. The survival of multi-party democracy, which depends on the existence of a strong and credible opposition, was being threatened by our continued participation in the GNU”. The ANC, without reservations, accepted the NP’s announcement that it will withdraw from the GNU. Serious challenges faced the new government at that time included a stagnant economy with high and rising unemployment, high inequality between and within the different race groups and widespread poverty. To tackle these problems the government announced a Reconstruction and Development Programme (RDP) in 1996, which was essentially social democratic in orientation and aimed at the empowerment of the poor. Subsequently, the government abandoned the RDP in favour of a Growth, Employment, and Redistribution (GEAR) policy that aimed at job creation through a neo-liberal focus on structural reform of the economy, trade liberalisation privatisation and the attraction of foreign investment. However, the Government of National Unity lapsed at the end of the first Parliament in 1999. • Kotze, D and Solomon, H. (2008). The state of Africa post conflict reconstruction and development. Pretoria: African institute of South Africa.